Whether you need a small Boveda Pack to throw into a ziplock bag to humidify just a few cigars you'll be smoking on a day-trip or you need a large electronic Cigar Oasis humidifier for the closet you just converted into a walk-in humidor - some of you have done that! - we've got what you need! You can trust these products to keep your cigars fresh no matter your situation! Boveda 65% Humidity Control Pack - Boveda's patented 2-way humidity control continually responds to ambient conditions by adding or removing moisture to affect the environment and deliver the pre-determined RH% within +/- 1%. Why 65%? In general, Cuban cigars develop mold at a lower RH level than non-Cuban cigars. And, some customers prefer a slightly drier cigar to assist with a consistent burn, or because htey live in a wet climate where Boveda's primary job is actually to remove moisture from the air. Boveda 69% Humidity Control Pack - Boveda's patented 2-way humidity control continually responds to ambient conditions by adding or removing moisture to affect the environment and deliver the pre-determined RH% within +/- 1%. Why 69%? In a perfectly airtight environment 69% humidity creates the perfect aging environment for cigars. High end humidors, humidors made with thick wood, acrylic humidors, humidor bags and coolerdors all benefit from 69% Bovedas because only small changes to the environment are needed on a day-to-day basis. 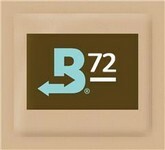 Boveda 72% Humidity Control Pack - Boveda's patented 2-way humidity control continually responds to ambient conditions by adding or removing moisture to affect the environment and deliver the pre-determined RH% within +/- 1%. Why 72%? When you account for air leakage in a middle-of-the-road humidor, the 72% Boveda will more than likely maintain the 68-69% sweet spot for storing cigars. Boveda 75% Humidity Control Pack - Boveda's patented 2-way humidity control continually responds to ambient conditions by adding or removing moisture to affect the environment and deliver the pre-determined RH% within +/- 1%. Why 75%? Glass-top and inexpensive humidors tend to leak worse than their counterparts, and therefore they need a bit more horsepower to keep optimum humidity. If your humidor has bad seals or thin walls, this packet should get you right into the 68-69% zone. Boveda 84% Humidity Control Pack - Boveda's patented 2-way humidity control continually responds to ambient conditions by adding or removing moisture to affect the environment and deliver the pre-determined RH% within +/- 1%. Why 84%? This Boveda takes the hassle and guesswork out of seasoning your wooden desktop humidor and makes it easy! Proper seasoning is critical to getting the performance and flavor characteristics that wooden humidor storage provides, so the 84% Pack raises the moisture level of the wood inside your humidor slowly to prevent cracking, warping and shock to the wood. Simply place one 84% Pack (for every 25 cigar capacity) into your humidor, close the lid, and allow the humidor to rest undisturbed for 14 days. After 14 days the wood will have reached equilibrium at between 68-70% relative humidity. At that point the 84% Pack(s) can be removed and replaced with standard Boveda packs at the RH level you - and most importantly, your cigars - prefer! Note: any other method of seasoning, like wiping the humidor walls down with water, can lead to the wood warping, cracking, and becoming moldy. Boveda MINI 69% Humidity Control Pack - Boveda's patented 2-way humidity control continually responds to ambient conditions by adding or removing moisture to affect the environment and deliver the pre-determined RH%. 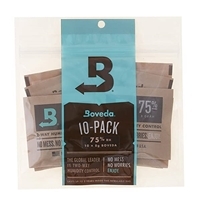 Boveda MINI 72% Humidity Control Pack - Boveda's patented 2-way humidity control continually responds to ambient conditions by adding or removing moisture to affect the environment and deliver the pre-determined RH%. Boveda 2-Pack Spanish Cedar Holder - This cedar holder contains slots for two standard-sized Boveda Packs and mounts to the lid of your humidor with a magnetic mounting kit or rests inside your humidor. Dimensions (LxWxD): 7 1/4" x 6" x 5/8"
Boveda 4-Pack Spanish Cedar Holder - This cedar holder contains slots for four standard-sized Boveda Packs and mounts to the lid of your humidor with a magnetic mounting kit or rests inside your humidor. Dimensions (LxWxD): 7 1/4" x 6" x 1"
Cigar Oasis Excel Electronic Humidifier - Cigar Oasis Excel is a small electronic humidifier that is fully automatic. Just plug it in using a paper thin power cord that fits between the hinges on the back of the humidor, or connect the optional battery pack, and it's ready to go. The internal hygrometer displays the humidity in the humidor and also is used to set the control point which can be adjusted to your preferred RH%. The unit comes with a refillable, replaceable water cartridge that uses distilled water only. Cigar Oasis Excel is designed to humidify 4 Cubic Feet or up to 300 cigars. Dimensions (LxWxH): 6" x 2" x 3 1/2"
Cigar Oasis Plus Electronic Humidifier - Cigar Oasis Plus is an electronic humidifier that is fully automatic. While it is the same size as the Excel, the basic difference is in the change of airflow and water cartridge to allow the unit to pick up more moisture and provide more rapid humidification for larger humidors, chests and end table humidors. The Cigar Oasis Plus comes standard with a large water cartridge for distilled water only which uses foam to eliminate water splashing around. This unit may be used with an AC Power adapter since it will run more frequently in larger humidors. However, when needed, an optional battery pack can be attached to the control unit for battery-powered operation. The internal hygrometer displays the humidity in the humidor and also is used to set the control point which can be adjusted to your preferred RH%. 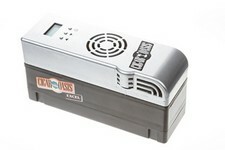 Cigar Oasis Plus is designed to humidify 10 Cubic Feet or up to 1,000 cigars. Dimensions (LxWxH): 6" x 2" x 3 1/2"
Cigar Oasis Ultra 2.0 Electronic Humidifier - Cigar Oasis Ultra 2.0 is an electronic humidifier that was designed to mount on the lid of a humidor, on a tray, or under a tray, with minimal space requirements. The Ultra 2.0 can be powered using an outlet or using the internal, rechargeable Li-Ion battery. The fan pushes out humidity until the preferred RH% level is reached. When operating on outlet power it samples the humidity continuously. On battery power the unit goes to sleep to extend battery life, sampling the humidity only every five minutes to make adjustments. 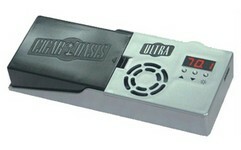 Cigar Oasis Ultra 2.0 is designed to humidify 1 1/2 Cubic Feet or up to 100 cigars. Dimensions (LxWxH): 7" x 2 1/2" x 1"
Diamond Crown Humidification System is the only humidification system with a revolutionary water reservoir and wicking material to generate continuous moisture. Fully adjustable, this system with sliding stainless steel vents will keep your cigars at the optimal humidity level, never too dry or too moist. The Diamond Crown Humidification System eliminates the guess work of when it needs refilling. When the reservoir window shows empty, simply refill it with distilled water. Designed to humidify up to 200 cigars. Western Caliber 4R Gold Digital Hygrometer - Imagine a classic look of a round analog hygrometer but with advanced, accurate digital electronics! The Caliber 4R has legendary accuracy and is designed to eliminate gauge flutter with slow response updating time. It displays humidity and temperature readings on its digital panel and has the ability to record maximum and minimum readings, as well as displaying in either Celsius and Fahrenheit. Accurate to +/- 1% @ 70% RH. 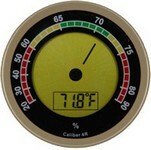 Western Caliber 4R Silver Digital Hygrometer - Imagine a classic look of a round analog hygrometer but with advanced, accurate digital electronics! The Caliber 4R has legendary accuracy and is designed to eliminate gauge flutter with slow response updating time. It displays humidity and temperature readings on its digital panel and has the ability to record maximum and minimum readings, as well as displaying in either Celsius and Fahrenheit. Accurate to +/- 1% @ 70% RH. Xikar Crystal Clear 2oz Humidifier Jar - Never let your humidor go dry again! Xikar's Crystal Jar humidifiers perfectly maintain a 70% relative humidity, and maintenance is easy! Just unscrew the cap and place in your humidor! Simply watch the crystals, when they shrink to about half their original size recharge them with distilled water. Designed to humidify up to 75 cigars. Dimensions: about 2" x 2".